In 1805 the church of St Leonard was built of sandstone in an octagonal design with a legacy from J. Hawkins-Browne, a relative of Isaac Hawkins-Browne, Lord of the Manor of Malins Lee. He and Thomas Gisborne, as executors of J. Hawkins-Browne’s estate arranged for the erection of the church. 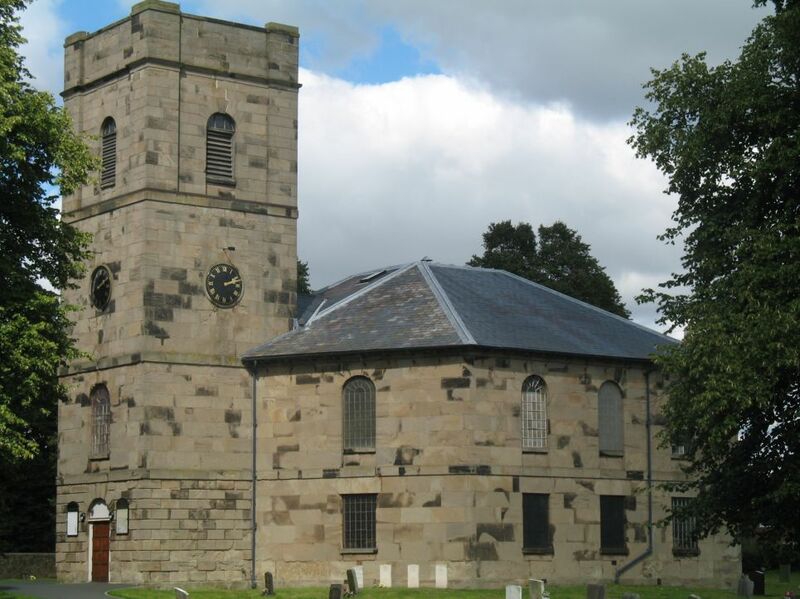 It was designed by Thomas Telford and was a scaled down version of of the design for St Mary’s church in Madeley. It was originally built to seat 800 people, but the galleries were extended in the 1830’s to allow for a further 200 seats The bells, a medieval silver paten and a chalice were taken from the Holy Trinity Church in Dawley to St Leonard’s as it was to be the parish church. After pressure from some parishioners for the reopening of Holy Trinity church, services were resumed there in 1818. In addition, the plan for St Leonard’s to be the parish church for Dawley was halted in 1821 when it was discovered that an Act of Parliament would be needed to recognise its status. To promote an Act of Parliament would have been be too costly so the plan was abandoned and St Leonard’s then operated under Dawley Church as a chapel of ease being served by curates licensed to the Vicar of Holy Trinity until it was assigned a chapel district in 1843 in recognition of the growing population of the area. Legend has it that some male parishioners from Holy Trinity Church came one night and took back the bells, 16th. Century silver plate and the chalice dating from 1746 that had been given to St Leonard’s and in 1845 they were returned to their places in the new Holy Trinity Church. William Botfield donated a new set of plate in 1833 and 5 bells in 1839 to replace the stolen items. According to Rev. Roger Hill (1980), in “1887 Charles Carr of Smethwick to celebrate Queen Victoria’s Silver Jubilee recast the bells and added a sixth. The bells have the following inscriptions: 1. Goodwill towards men; 2. Gloria; 3. We bless Thee; 4. We give thanks to Thee; 5 We praise Thee; 6. On Earth Peace.